Sivoia QS Triathlon roller shades are a contemporary and stylish window treatment that combines superior functionality with a clean and elegant aesthetic. With a 3-5 year battery life, you will enjoy years of operation without worrying about battery replacement. Thanks to their wire-free design, they are the perfect retrofit solution. Wireless operation allows for control from anywhere in the room. Control options include, Pico Wireless Controls, seeTouch QS Wireless keypads, GRAFIK Eye QS Wireless, RadioRA 2 and HomeWorks QS. Innovative headrail simply tips forward to reveal the battery tray, making it easy to change the batteries without taking down the shade. 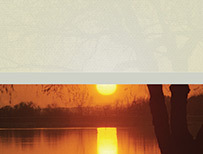 Shades are available in a wide variety of fabric options and textures. 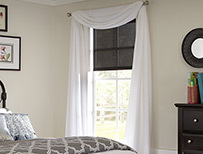 Choose from sheer, translucent, and blackout fabrics. 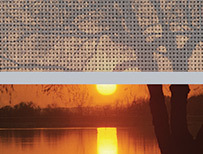 Roller shade sizes available as wide as 96" and as tall as 120"
Triathlon WIDR for shades up to 144”W x 144”H. Battery Boost is now available for roller shades. The combination of additional batteries and patent-pending Lutron technology can enhance the battery life by upto 80%! 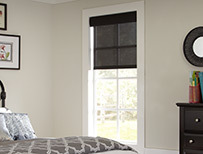 This feature is available for battery-powered roller shades with a minimum width of 38”, including Sivoia QS Triathlon WIDR shades.